I just downloaded Toast 16 Titanium for Mac and I am unable to play the burned DVDs. The burn process went smoothly and I received a message that it was burned successfully. But when I attempt to play the DVD in DVD Player it doesn't recognize the DVD and won't play. I had been using Toast DVD for Mac successfully for years with no problem. Could my problem be settings? I've attached a screen shot. 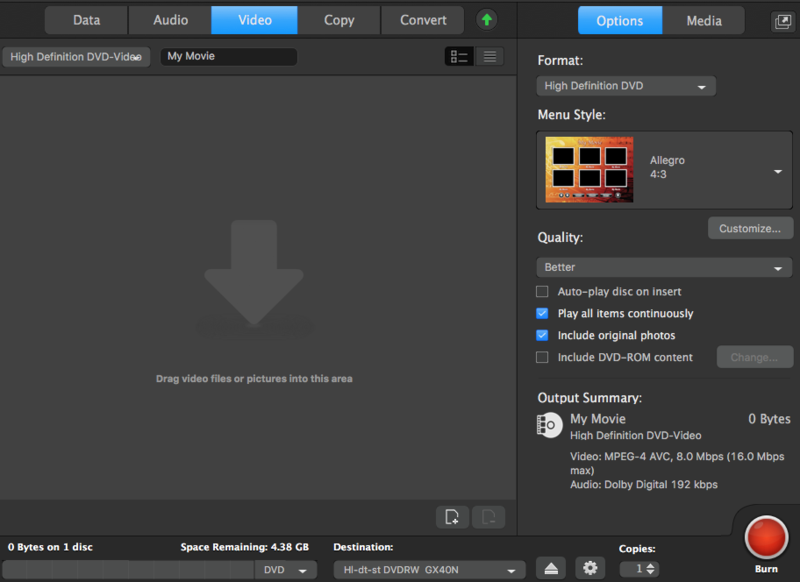 The screenshot shows the setting “High Definition DVD-Video”, which is much like Blu-ray content on DVD media. You need a (compatible) Blu-ray player to play such discs. A regular DVD player will not recognise or play such DVDs. See page 27–28 of the PDF User Guide. To create discs that will play on a regular DVD player, choose “DVD-Video” from the format selection menu. If you did try the disc in a Blu-ray player, and it still won’t play, then please post the details of said player. Thank you oldarchiver! You solved my problem. I'm having the same issue. I admit I'm new to the software as the last time I used Titanium I think was version 8. I'm burning to a Memorex DVD+r and used the DVD Video selection and it won't play in my Sony Blu Ray player in my living room. Thoughts? My source video was an MP4 created from Imovie. I'm exporting that now to a .mov file to see if that makes a difference. I could also try an MKV file if that would help. Update: tried converting the file to .mov before burning. Heading to Wally World for new DVD's. Will try new DVD+R and DVD-R to see if that helps. My DVD's are old so I thought I'd eliminate that possible issue. (I read they can go bad but have no idea if that is true). Does your disc play on your Mac in Apple DVD Player? If you open the burned disc on your computer, do you see the VIDEO_TS and AUDIO_TS folders? Tip: You can “burn to file” (Save as Disc Image), and test the virtual disc without wasting discs. If that plays okay, you can burn the disc image to disc, knowing that the structure and data are fine. Try burning at half the rated speed (e.g. at 8× for a 16×-disc, or 4× for an 8×-disc), instead of the default “Best” speed. I'm burning to a Memorex DVD+r and used the DVD Video selection and it won't play in my Sony Blu Ray player in my living room. Heading to Wally World for new DVD's. Will try new DVD+R and DVD-R to see if that helps. My DVD's are old so I thought I'd eliminate that possible issue. (I read they can go bad but have no idea if that is true). Memorex isn’t top tier, but not so bad that the name has gone. I have found Verbatim “AZO”-dye discs to be very reliable, but not many brick-and-mortar stores carry those anymore (i.e. order online). DVD+R or DVD-R (single layer) shouldn’t matter that much on modern set top players. Sony is one of the companies behind the +R standard, so any advantage is most likely used on their equipment, but the little difference is mostly geared towards recording, not playback. Optical disc longevity is mostly affected with the care (heat, light, acids, scratches, bending stress). If the discs are shrink-wrapped and stored in the dark (closet or box), they’ll last a long time in prime condition. My source video was an MP4 created from Imovie. I'm exporting that now to a .mov file to see if that makes a difference. I could also try an MKV file if that would help. Update: tried converting the file to .mov before burning. If Toast produces a working VIDEO_TS folder, then the source file format isn’t making the difference. All the discs I've burned work fine when played in the burner. None work in my Sony Blu Ray Player (circa 2010 or 2011). Does you set top player play any recordable DVD from any source (produced elsewhere)? Pre-recorded (‘stamped’) discs always have better readability, so those do not qualify for this test. CD-R and BD-R are read at different wavelengths (colors), so those do not qualify for the DVD±R test. If other discs also give read issues, then perhaps the reading lens is dirty/dusty to a degree that it affects the readability of the subtle reflectiveness of recordable DVD dyes. So some success. I was able to get an RiData DVD+R to burn properly using the 6X write speed so maybe it was just that? I don't have any explanation as that was the 2nd DVD I burned at that speed but wish me luck! I have many more to make. One interesting note: Toast provides available write speeds based on the blank disc. So my single layer RiDATA DVD+R have Best, 6X, 8X, 12X, and 16X. The Memorex dual layer DVD+R's offer Best or 4X. I'm sticking with 6X on the RiDATA discs. Oh, and yes, my blu ray player plays DVD's and Blu Ray discs without fail...just tried a bunch. And I nearly forgot to thank you for being so responsive and helpful!! Last update...set the 6X burn and have made 5 good copies in a row. I guess that was the trick! Thanks again! Toast provides available write speeds based on the blank disc. So my single layer RiDATA DVD+R have Best, 6X, 8X, 12X, and 16X. The Memorex dual layer DVD+R's offer Best or 4X. I'm sticking with 6X on the RiDATA discs. Yeah, reduction of the burn speed (by half) may help readability of the burned disc. My proposed test was specifically about recordable DVDs. Your comment doesn’t reflect that. Other DVDs or BDs don’t matter for this test. But it seems you found a working burning procedure, so well done and good luck to you.